Tenzin Phuntsok Rinpoche (Geshe Lama Konchog’s incarnation) and Lama Zopa Rinpoche. Because so many of you enjoyed the previous picture, here is another, and note the adorable socks! Rinpoche is currently in Taiwan until April 8th. Rinpoche’s next teachings are scheduled in Singapore between May 7th – 21st, where Rinpoche is teaching and giving initiations including Great Medicine Buddha and Amitayus, followed by teachings in Malaysia (including a short Tara retreat) between May 23rd – June 4th. “A retreat place is not for gaining power like black magic, it’s not for a honeymoon or holiday. Also it is not a place in which to be spaced out. Succinct and succulent advice from Rinpoche for us all. This advice is excellent for anyone working for a center or study group, particularly when you are feeling overwhelmed – especially for directors, as Rinpoche explains how a director should expect to be an object of criticism! Also included, Rinpoche’s pith advice on generating your motivation for the day. ….If one obtains [and follows] the guru’s advice, instruction – then all wishes will succeed, one will achieve infinite merit. It’s good to remember these benefits that are explained in the teachings. One has to remember that when one is working, even if one doesn’t live at a center but works at a center, try to remember this. Especially when one faces difficulties, when one meets difficulties doing the work, offering service, it’s very important to remember this and in this way there’s something to enjoy. You see it is a path. What one is doing is a path to enlightenment. By seeing the benefit, there’s great enjoyment. 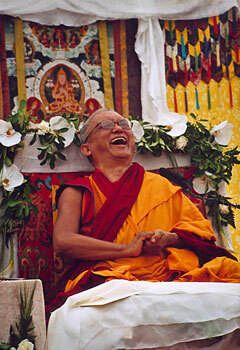 Please enjoy the sound of Rinpoche laughing! This is a lovely 90 second teaching clip of Rinpoche advising that by meditating on impermanence, whatever happens in life doesn’t disturb you. This short teaching can be used by centers to introduce and promote Rinpoche. I am very happy, inspired and excited by this land you found and very grateful to the couple who are offering it. We need a lot of merit to use this land for the Dharma so we need to make this statue of 1000 armed Chenrezig 9 feet high. I don’t want you to faint at the height…. I know you may not be familiar with my sizes …sorry. But this will be unbelievable benefit for Tasmania, to develop compassion, thru Nyung Nays and Chenrezig retreats. I think SOOOO GOOD. Ok? 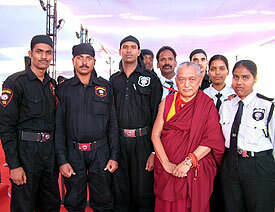 Lama Zopa Rinpoche made friends with the elite Indian commandos that guard His Holiness. As Rinpoche is presently in Taiwan, we have few new pictures at this time. Remember to visit the photo gallery, which has hundreds of pictures of Rinpoche teaching and practicing, laughing and praying throughout the world.